Track your riders at Versus. Full GPS tracking of your favorite riders for $29.95 NBC Sports Tour de France All Access. Do you know your climbs? Cyclist nicknames in crossword puzzle at: Cyclists Nicknames by Paddy Sweeney . Find out who is called Spud, and Skippy and the God of Thunder. 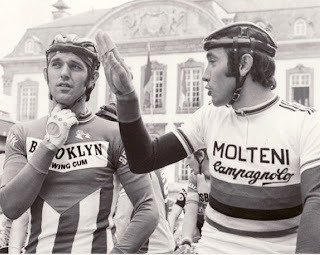 Let's play along with Phil Liggett and Paul Sherwen. This game is worth revisiting Tour de France 2009 Phil and Paul Bingo Game offered by BikeHugger.com. I think every fans goal should be to recreate this game for 2011. There is also a Tour de France board game at Teacher's Discovery. Who knew.